Wearable devices are still kinda expensive for several reasons. First, the components need to be small. Second, the components need to be pretty resilient to getting bashed about a little during daily use. And finally because people aren't buying that many of them yet, so economies of scale aren't there. Now, a team from Florida State University might have a partial answer to those first two problems, with a new class of motion sensor that could make wearables do more for less. 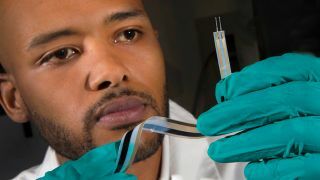 Richard Liang, director of the High-Performance Materials Institute and professor at the FAMU-FSU College of Engineering, has led the development of an advanced series of motion sensors made using buckypaper - thin, flexible sheets of carbon nanotubes. Inside the sensors, a strip of buckypaper is combined with silver ink electrodes that can be printed on a normal inkjet printer. The result is a sensor that is more sensitive than the flexible metallic sensors used in some wearables, but not as rigid and fragile as more-sensitive semiconductor sensors. “We measure sensors by gauge factor, which indicates how much resistance value changes as a material is strained or bent,” said doctoral candidate Joshua DeGraff, the lead author of a paper describing the new technology. The next step in developing the sensor will be to further improve on the thickness of the device, allowing it to be integrated into clothing, as well as testing it on more complex models. “For sensor technology, you need it to be flexible, you need it to be affordable and you need it to be scalable," said Liang.